Last week, I dove into Padres outfielder Manuel Margot as a potential deep sleeper for 2019. I like Margot because he’s young, he’s got tools and his peripherals showed signs of offensive maturation that his surface numbers didn’t quite reflect. Much of that applies today, too. Max Kepler’s career slash line would suggest he’s a disappointment, at least relative to his prospect status. He was Baseball America’s number 30 overall prospect entering the 2016 season, a big-league ready outfielder with an elite approach and above-average power and speed. Three years later, he’s sitting on a .233/.313/.417 line and is coming off a career-worst OPS. It doesn’t take much digging, though, to see the progress Kepler’s made at the plate. Currently coming off the board 67th among outfielders, Kepler’s projected output dwarfs his current draft status. 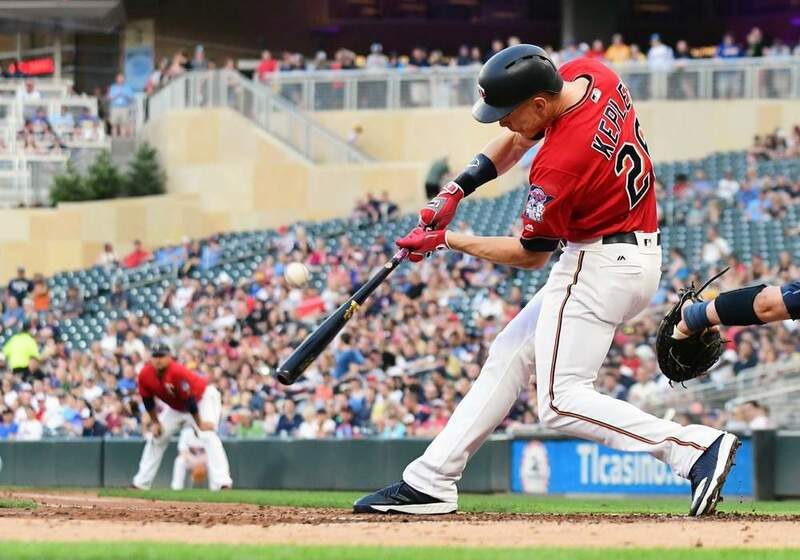 Is Max Kepler Primed to Break Out? We’ll get the easy stuff out of the way first. Using Fangraphs’ Season Stat Grid, we can see the players who changed their profile most year-to-year. Setting a 500 plate appearance minimum in each season, a list of players who cut their strikeout rate the most between 2017 and 2018. There’s Kepler, tied for fourth. It’ll hardly come as shock, but the three players above him each saw their batting average spike by at least .018 points. More balls in play means more opportunities for hits. Simple. Yet Kepler’s batting average dropped from .243 to .224 in that same span. Of course, dreadful ball in play results had a lot to do with this. Only Carlos Santana and Yangervis Solarte had a lower BABIP among qualifiers than Kepler’s .236. Some of that is admittedly Kepler’s doing; he consistently has one of the league’s lowest line drive rates. His true talent BABIP is almost definitely not .236, though. Even if he doesn’t improve further as a player, his results should improve through positive regression alone. There’s a good chance he’s not done maturing as a hitter, though. In isolation, making more contact is always a positive. Sometimes, though, that contact comes with a tradeoff. One need look no further than the table above. Corey Dickerson posted baseball’s greatest season-to-season strikeout rate cut last season. It improved his batting average .018 points. With that increased emphasis on putting the ball in play came a huge drop-off in power. Dickerson’s slugging percentage fell .016 points and he lost 14 home runs from his 2017 tally. (Admittedly, Dickerson’s counting stats were depressed by playing in 15 fewer games in 2018). For all his changes, Corey Dickerson… was exactly the same hitter. He posted an identical 115 wRC+ in each season. He got there in very different ways, but he didn’t really improve. Dickerson just changed. Max Kepler improved. He didn’t trade any power for his contact uptick. To the contrary, he hit the ball significantly harder in 2018. 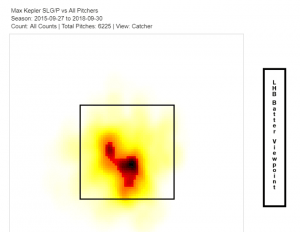 Rotographs’ Al Melchior recently found that a hitter’s exit velocity on air balls was his most meaningful Statcast characteristic in forecasting the following season. Kepler’s logged substantial MLB time in each of the last three seasons. From Baseball Savant, his respective percentile rankings in average exit speed on air balls in those seasons (minimum 100 batted balls): 26th, 29th, 68th. Not only was Kepler making significantly more contact, he was making significantly more meaningful contact. It’s not easy to do both simultaneously. Can we see exactly where Kepler fared differently? One thing we can dismiss quickly is the idea of a swing change. Kepler’s been vocal about not joining the fly ball revolution. That’s fine; not every player needs to adopt the same mechanics. What’s optimal for Justin Turner might not be optimal for Max Kepler. Yet Kepler’s batted ball metrics did change, rather significantly in fact. He’s cut his ground ball rate ten percentage points over the last two seasons. That’s a Turner or JD Martinez level of adjustment. Yet we know- or at least Kepler publicly maintains- that’s not about swing path. So how else might a player make more contact, hit the ball harder and elevate? Change the pitches he swings at. Indeed, Kepler refined his approach in 2018. For one, Kepler swung at more strikes and took more balls than he ever has before. But it goes beyond that. 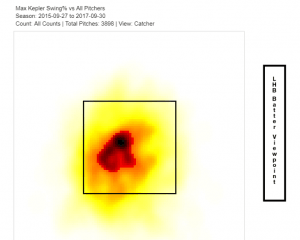 Kepler became more comfortable with his personal strike zone. I’ll borrow some heat maps from Fangraphs here. Consider where Kepler has done his damage over the course of his career. Like most left-handed hitters, Kepler likes the ball down. He also fares best when gets his arms extended. Now consider the pitches he swung at through 2017 versus 2018. It’s a subtle change, but it’s there. 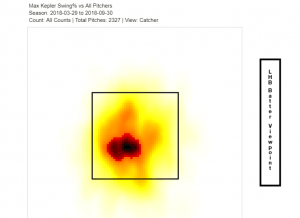 Max Kepler became more focused on the pitch down and middle-away. Maybe Kepler wanted to be more selective; maybe it’s just the product of logging 1,000 MLB plate appearances. Given his nontraditional background, it wouldn’t be surprising if he needed an extra year or two to really come into his own. I have no idea if this was an intentional adjustment he made, but it was a positive one regardless. Not in the results yet, but the process metrics suggest Kepler deserved better. Those old scouting reports led by lauding Kepler’s approach. It would only be fitting if that same approach drove his breakout. In 2018, Max Kepler’s results lagged his true talent. Yet that talent began to shine through last season, and fantasy owners should be optimistic about what he can offer in 2019. Swing at better pitches. Make more contact. Hit the ball harder. It doesn’t always have to be complicated.